What Can I Do with a Master’s in Computer Science? With a master’s in computer science, and some experience in the field, you can be competitive for mid- to high-level positions in computer systems and applications. What positions can you compete for? It depends in part on your previous experience (including experiences in other fields like business, graphics, or biology). Virtually everyone who has a master's in the field has a previous baccalaureate degree, and many have at least a few years of experience in the work world. If your previous job hasn’t given you quite the experience you need, though, master’s level internships and graduate projects provide additional opportunities. 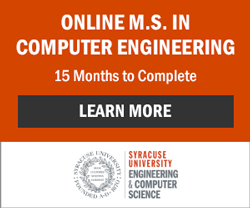 Syracuse University's College of Engineering and Computer Science offers an online M.S. in Computer Science focusing on subjects crucial to understanding emerging systems. Request Information about this program. Computer science is a good foundation for software engineering, systems engineering, computer security, or virtual reality. Computer science is a good foundation for software engineering, systems engineering, computer security, or virtual reality. When it is combined with expertise in other fields, additional opportunities open up. Software engineers are involved with the architecture and design of software projects. They may write algorithms, code, or participate in the testing, deployment, and maintenance of the finished product. You can get a job in software development with a bachelor's degree (and sometimes less), but the combination of a master's and real world experience can help you move up to positions of responsibility at prestigious companies. You don’t have to have a master’s to work for Google, for example – but the advanced degree is a plus. The search engine/ software giant lists the master’s degree as a preferred qualification for positions like Software Engineer and Enterprise Software Tool Developer. The advanced degree is strongly preferred for Internal Tools Developer at YouTube. Disney is yet another example of a desirable and industry-leading employer that favors master’s level candidates for many positions. Some experienced workers move into roles as lead engineer or project manager with their current employer. They may be in charge of one stage (for example, architecture or quality control) or they may oversee the whole process. It’s not all about having that slip of paper. Some companies consider both bachelor’s and master’s candidates, but list a wide range of preferred skills and work experiences. Internships can also help you get the needed experience. Computer science is a good foundation for computer systems careers. There are a number of jobs which require knowledge of both hardware and software systems. Systems specialists may make recommendations and purchases, configure products, and write code. A systems integration engineer may design customized business solutions for clients, integrating multiple hardware and software systems. The job might include configuring systems for compatibility and troubleshooting and diagnosing hardware and software issues. System integration engineers may work for the government or private industry. Some work with embedded software. Companies like GE hire computer scientists to coordinate both their human and technical systems. A related career is enterprise application integrator. EIAs are experts in integrating and modernizing legacy systems. Master’s level software engineers are also hired to design the apps that allow animators to create their illustrations. Walt Disney Animation Studios is among the better known and more prestigious employers. Computer scientists at the master’s level are considered for some governmental positions, like those that are offered through the National Security Agency (a part of the DoD Intelligence Community Defense Civilian Intelligence Personnel System). The focus is on researching and developing computer systems required for defense. Companies like Google hire master’s level computer scientists to carry out practical types of research. Most “pure science” research positions require a PhD, but a master’s is a step along the path. If you already hold a master’s degree in Computer Science, I hope this article helped get your job thought process stimulated. If you are considering your master’s in computer science or just starting out in the field and considering an undergraduate degree, you may want to research computer science programs to find one that will provide you with the skills you are looking for. What Jobs Can I Do With....? What jobs can I do with a Software Engineering Bachelor's Degree?